In a bowl, mix flour, cinnamon, nutmeg, baking soda and salt put to the side for the time being. Now, layer remaining ingredients in order given in a one quart wide-mouth canning jar. Pack down after each addition so everything fits. Add flour mixture on top. 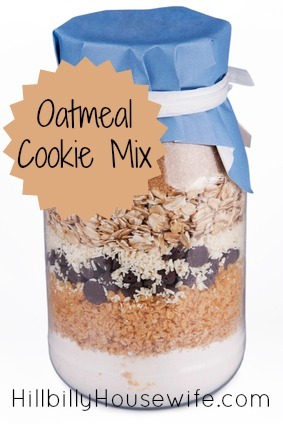 Instructions for tag: Pour the entire jar of cookie mix into large bowl. Mix until everything has been completely incorporated. Now, add 1 1/2 sticks of butter or 2 eggs, slightly beaten & 1 tsp. vanilla. Use your hands to make sure everything has been blended in and then roll into 1” balls. Place 2 inches apart on greased baking sheets. Bake at 350 for 11-13 minutes.